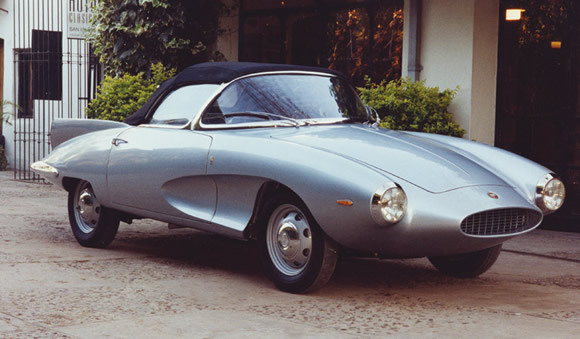 Franco Scaglione designed some of the most beautiful cars ever conceived and this 1957 Stanguellini is no exception. Built by Bertone for the Turin Motor Show all I have found out so far is that the car first appeared at Turin, then Geneva in 1957, and went from there to the Buenas Aires Motor Show. It was shown a few more times and then put into storage. In 1995 though it was revived when it's current owner restored it. Fiat fits into picture having supplied on of it's famous 1200cc motors so popular in those days. It's a great example of the style and aerodynamic thought put into cars at this time. The cut outs behind the front wheels and the wings are very cool however I'm sure it would look better with the top down. If you know anything about this car please email me or make a comment and I will update this post. Hopefully someone will know more about this classic and beautiful Italian.